Gibson ES-335TDC Model Semi-Hollow Body Electric Guitar (1961), made in Kalamazoo, Michigan, cherry red lacquer finish, laminated maple body, mahogany neck with rosewood fingerboard, original brown tolex hard shell case. This is a lovely example of one of Gibson's absolute classic electric guitars-an ES-335 from 1961, with features typical for that year. 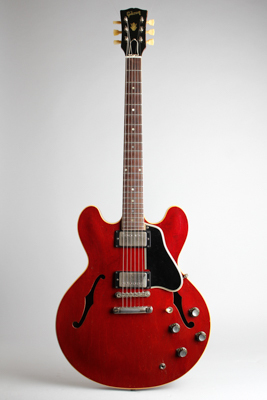 This is one of 420 cherry-finish ES-335's shipped in 1961, which was the model's first full year of being offered in the new livery- only 21 cherry red examples were sold in 1960. This new flashier finish option replaced the earlier natural variant and soon eclipsed the traditional sunburst as well, becoming one of the model's enduring trademarks. The "335" still carried a dot-inlaid fingerboard in '61, which would be changed to pearloid blocks the next year. The neck profile is wide and relatively flat, the famous "1960 neck" which replaced the much deeper, chunkier 1959 style at the dawn of the new decade. By the end of 1962 this would have evolved to a rounder profile again. All the hardware including pickup covers, tailpiece, ABR-1 bridge, and pickguard bracket are nickel plated. The pickups are PAF's which have never had the covers removed, and sound spectacular. This is an original stop tailpiece guitar which has never had a vibrato. At just over 7lbs. This is one of the lightest ES-335's we have ever had, and handles like a dream. Overall just a fantastic guitar, played but not abused, and sounds amazing in everything from straight jazz to funky blues to flat-out scream. It is still housed in a late example of the traditional 1950's brown Gibson case that was just being phased out, made by Stone Case company right here in Brooklyn NY. Overall length is 41 3/4 in. (106 cm. ), 16 1/8 in. (41 cm.) wide at lower bout, and 1 3/4 in. (4.4 cm.) in depth at side, taken at the end block. Scale length is 24 3/4 in. (629 mm.). Width of nut is 1 11/16 in. (43 mm.). This is a splendid and great-playing example of an early cherry-finish dot neck 335, beautifully original with some light wear overall. The guitar is unaltered except for a very professional refret; all hardware is original. There is finish checking and play wear overall but nothing seriously distracting-minor dings and scrapes, edgewear to the sides of the neck and the nickel plating is worn down to the underlying metal in spots. This is obviously a well-loved guitar, one of the best sounding 335's we have heard in a long time. All-in-all a splendid package complete with a very nice brown 1950's-style hard case and a box of old Gibson E-450 strings thrown in for good measure. Excellent - Condition.